Quince - Portugal 2 year old £17.50 - Pears and Quince Apple Trees and Fruit Trees For Sale. Buy at competitive prices with wholesale discounts. 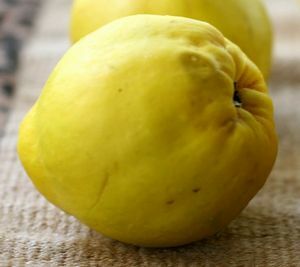 Generally considered the best flavoured quince, Portugal is a very good early variety with fruit ready for picking by the end of September. It is a very old variety, brought to England in the early 17th century. The fruits are large, ripening to a yellow orange with flesh that turns red when cooked. It is a vigorous tree but less hardy than some other varieties so better for warmer locations.